Instead of traditional phone system hardware, Avaya IP Office Server Edition is installed on a standard Linux server. This can be located within your premises or in a data centre, providing extra peace of mind. It’s perfect for any business wishing to embrace Unified Communications, Enterprise Mobility, and the option of having an off-site solution. Avaya Server Edition is also extremely scalable, with a capacity of 2000 users- ideal for companies expecting to grow. New users are easy and hassle-free to set up, as handsets that self-configure can be quickly and easily added to the network and ready for use right away. Read our product review here. Our Bristol and Southampton based engineers are experts in installing, maintaining and training users on Server Edition, so if you’re looking for a local partner to support you then we’re only a phone call away. Avaya Server Edition for IP Office is a perfect Disaster Recovery solution, as the system resides in a Server within a data centre. Many businesses these days are embracing the Cloud. Future proof your business by doing the same. Want to streamline your telephony across multiple sites? Server Edition is great for this. This Server based edition of IP Office has centralised Voicemail , on-hold music and a range of other applications and features that are centrally and easily managed. Having your phone system based in a Server makes it very easy to expand your capabilities quickly as your business grows. It runs as part of your server infrastructure, and connects desk phones, soft phones or smart devices to your phone system. Centred on a Linux server, this communications platform will connect your staff and allow collaboration on nearly any device. You can use a mixture of IP, analogue or digital phones alongside softphones, ensuring maximum flexibility, and there are video conferencing capabilities too. Like the other Avaya telephone systems we offer, the IP Office Server Edition is fully maintained and supported by our team of in-house engineers after installation. 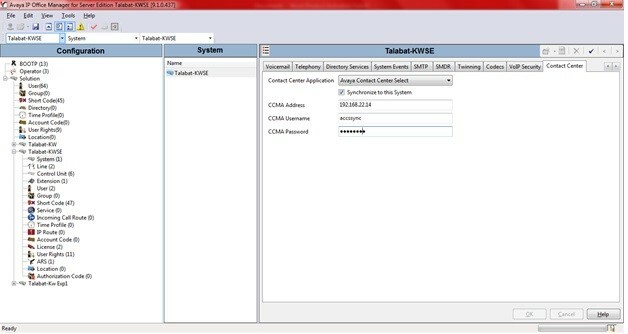 Server Edition comes with an intuitive management interface (see image above) that allows system administrators to easily access and manage the system configuration. Users benefit from sophisticated audio conferencing capabilities, and can share documents over the intuitive interface. Avaya Server Edition enables you to interact with your customers via voice, email, web chat, text or fax. Switch seamlessly between different modes of communication with the click of a button. Embed Avaya communications in popular desktop applications such as Microsoft Outlook, Microsoft Lync or Salesforce and save valuable time. Interested in Avaya IP Office Server Edition? Contact us today! Can be deployed in two set-ups: either using a centralised server or separate phone systems at each site. Seamless switchover from the old system, preventing disruption to the business. Works with IP, digital and analogue handsets, and can handle a combination of all three types. Interested in our Avaya Solutions?